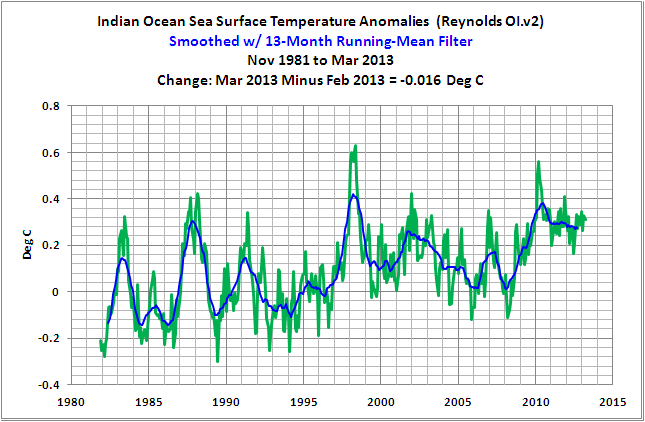 The following is a Global map of Reynolds OI.v2 Sea Surface Temperature (SST) anomalies for March 2013. It was downloaded from the NOMADS website. The contour levels are set at 0.5 deg C, and white is set at zero. 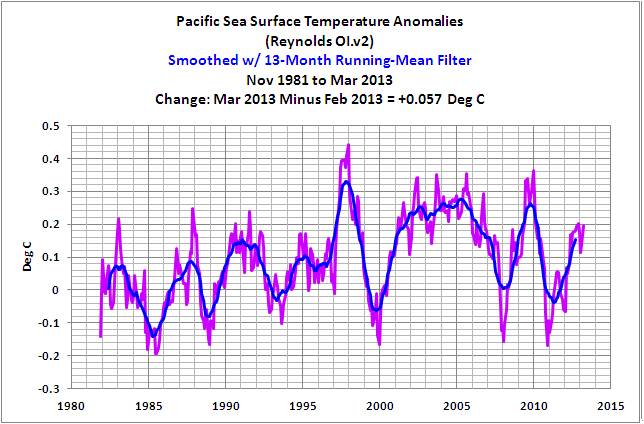 Monthly NINO3.4 sea surface temperatures warmed about 0.26 deg C since last month. They’re presently at about -0.1 deg C. They’re still well within El Niño-Southern Oscillation (ENSO)-neutral conditions, meaning they’re not El Niño or La Niña conditions. 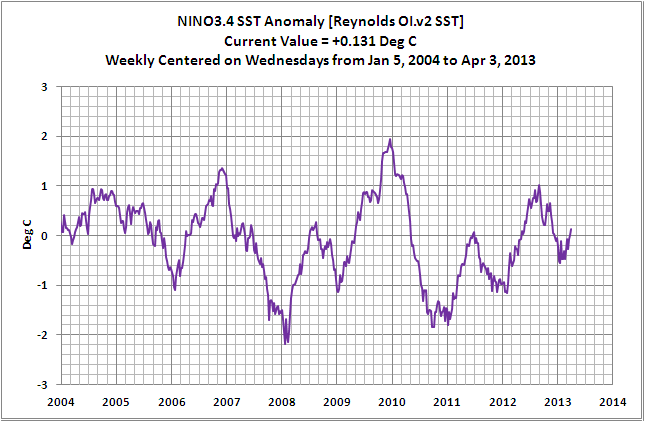 Also refer to the discussion of the weekly NINO3.4 data near the bottom of the post, because they’re continuing to warm. 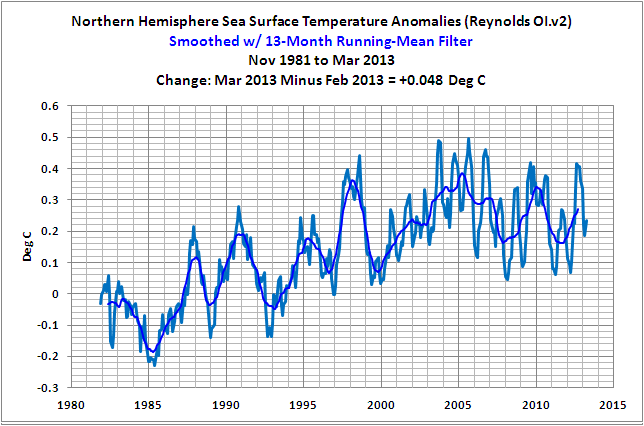 Global Sea Surface Temperature anomalies warmed a little (+0.017 deg C) from February to March, with the warming in the Northern Hemisphere only being partly offset by a slight cooling in the Southern Hemisphere. The only ocean basins that cooled were the South Atlantic, Indian, Arctic and Southern Oceans. 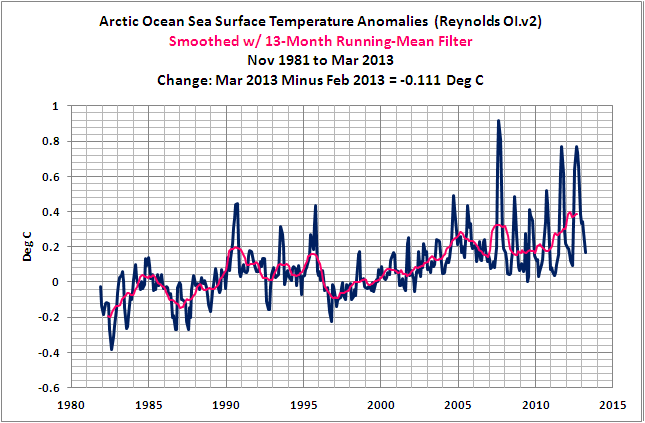 The monthly Global Sea Surface Temperature anomalies are presently at +0.213 deg C.
And second, the volcano-adjusted Sea Surface Temperature anomalies for the Rest of the World (90S-90N, 80W-180) rise in very clear steps, in response to the significant 1986/87/88 and 1997/98 El Niño/La Niña events. 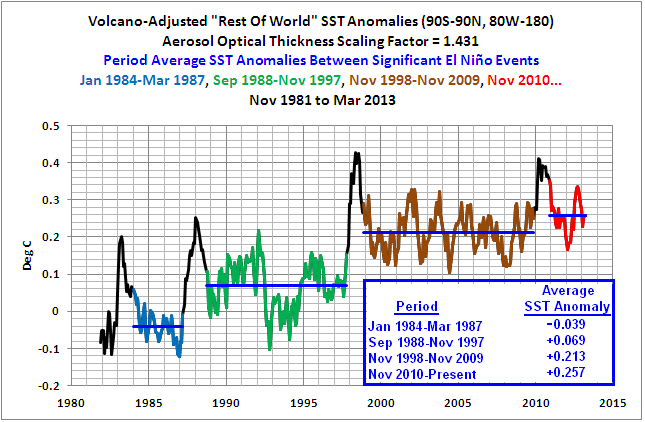 It also appears as though the Sea Surface Temperature anomalies of this dataset may have made another upward shift in response to the 2009/10 El Niño and 2010/11 La Niña events. 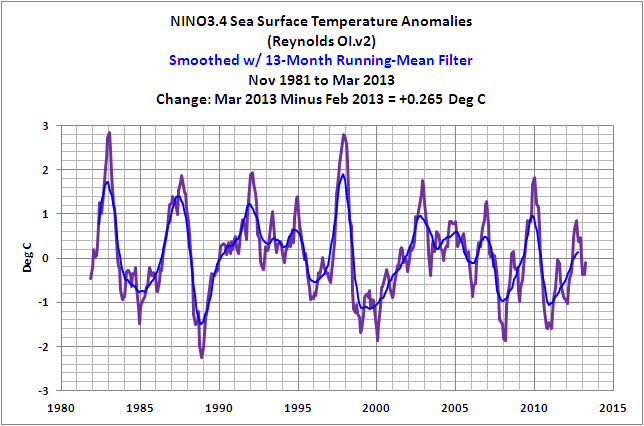 For those who are interested in the actual trends of the Sea Surface Temperature anomalies between the 1986/87/88 and 1997/98 El Niño events and between the 1997/98 and 2009/10 El Niño events refer to Figure 4 in Does The Sea Surface Temperature Record Support The Hypothesis Of Anthropogenic Global Warming? I further described (at an introductory level) the ENSO-related processes that cause these upward steps in the post ENSO Indices Do Not Represent The Process Of ENSO Or Its Impact On Global Temperature. And as noted above, it is discussed in detail in my recently published book Who Turned on the Heat? 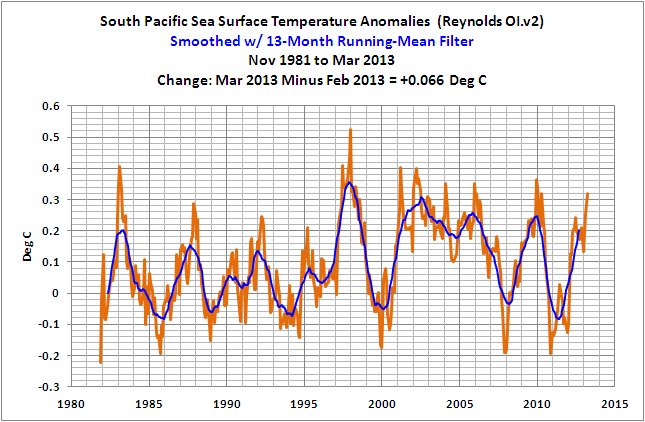 The Unsuspected Global Warming Culprit, El Niño-Southern Oscillation. 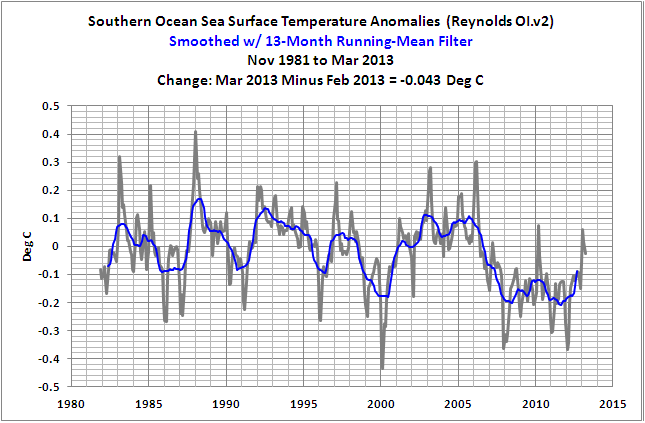 Other than the East Pacific and Rest-of-the-World data shown immediately above, the MONTHLY graphs illustrate raw monthly OI.v2 sea surface temperature anomaly data from November 1981 to March 2013, as it is presented by the NOAA NOMADS website linked at the end of the post. 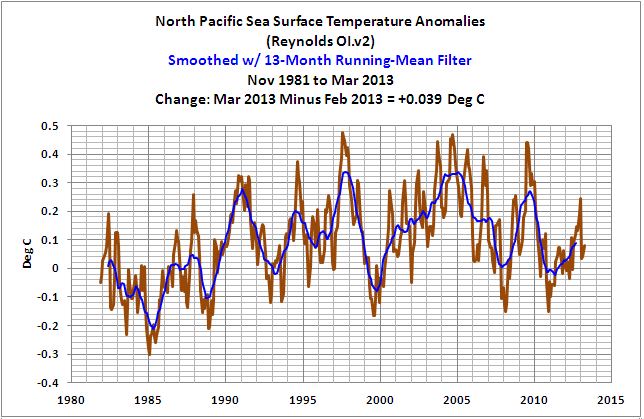 NOAA uses the base years of 1971-2000 for this dataset. 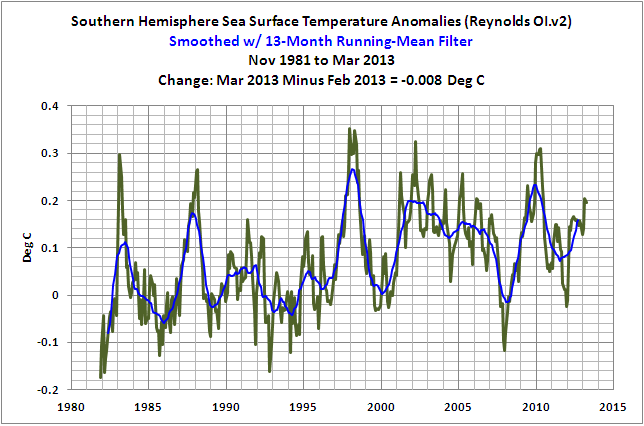 I’ve added the 13-month running-average filter to smooth out the seasonal variations. 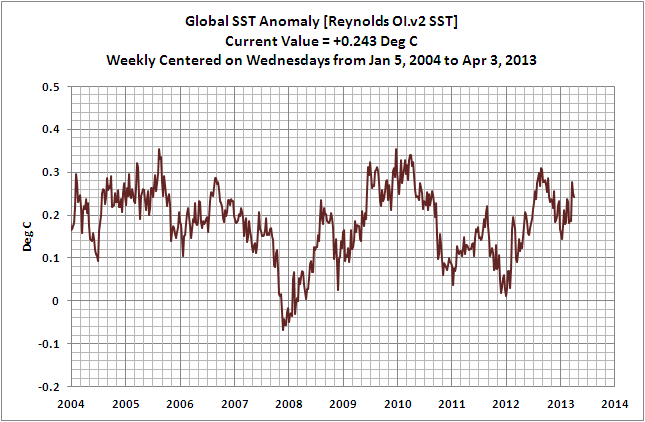 Note: I discussed the (now apparently temporary) upward shift in the South Atlantic Sea Surface Temperature anomalies in the post The 2009/10 Warming Of The South Atlantic. 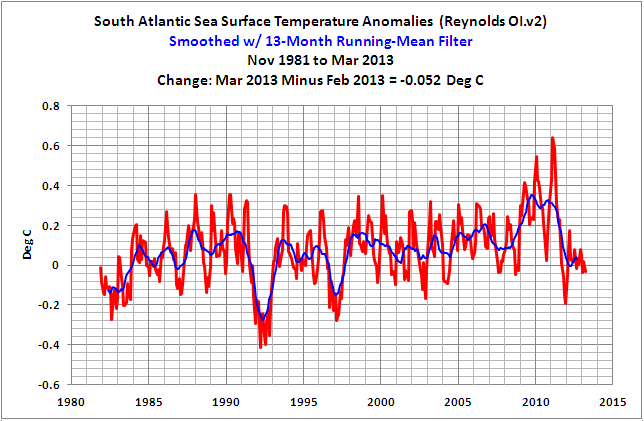 Prior to that shift, the South Atlantic sea surface temperature anomalies had been relatively flat for about two decades. 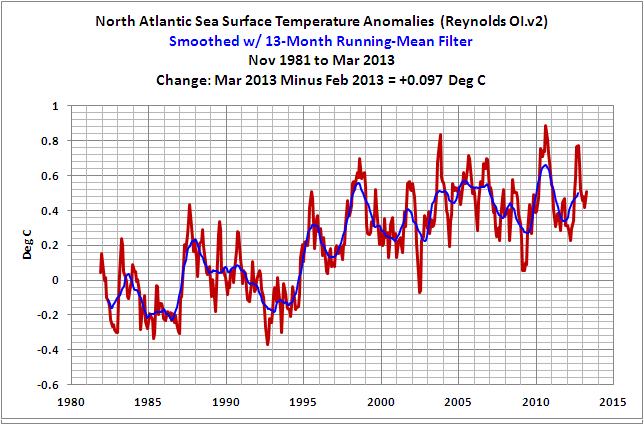 It looks as though the South Atlantic sea surface temperature anomalies are returning, or have returned, to the level they were at before that surge, and where they had been since the late 1980s. We’ll have to see where things settle over the next couple of years. 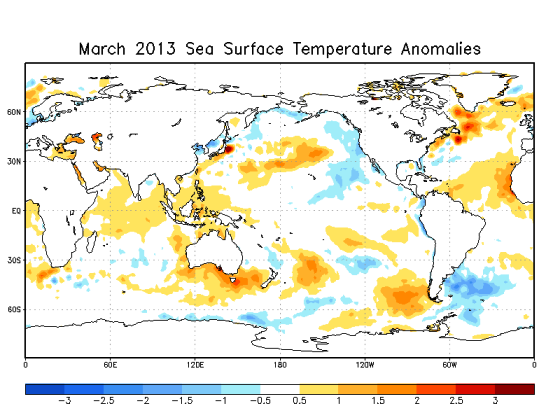 The NINO3.4 Sea Surface Temperature anomalies based on the week centered on March 3, 2013 have warmed above zero. 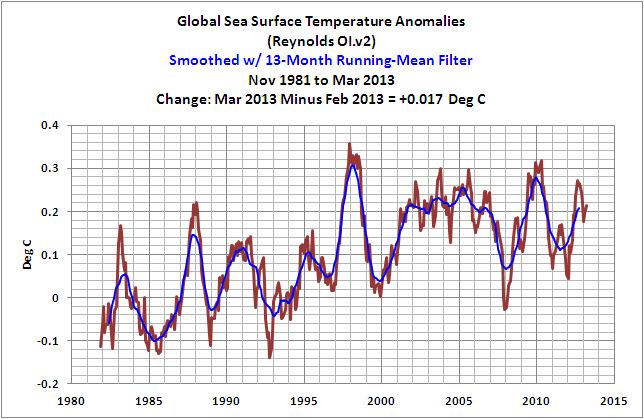 They are presently at +0.13 deg C.
Global sea surface temperature anomalies have cooled for two weeks after a sudden warming surge 3 weeks ago. 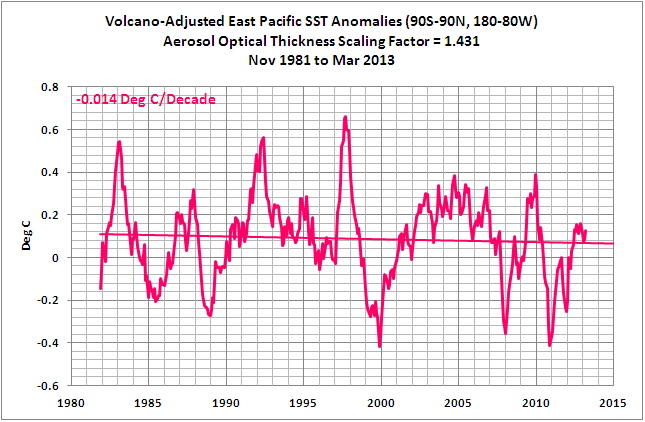 They are at +0.243 deg C.
Pingback: A Big Picture Look At “Earth’s Temperature” – “The Pause” Update | Watts Up With That?